Burgundy Bernie is made from Laura Ashley Upholstry grade fabric with a floral woven in design. The colours in the front fabric; goldish hues teamed with rich burgundy and a touch of black. His front is made from fabric with a woven in paisley design which complements his wings. 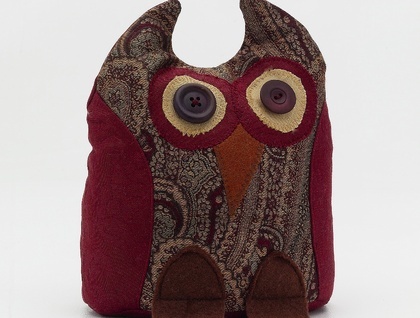 He has a chocolate beak and Chocolate feet,and his eyes are made from retro buttons Whooo loves Bernie?